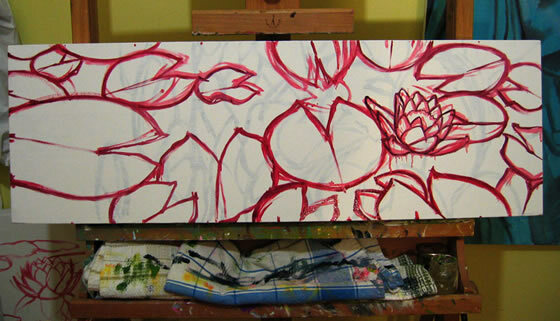 The Waterlily series continues with another10x30 inch painting. 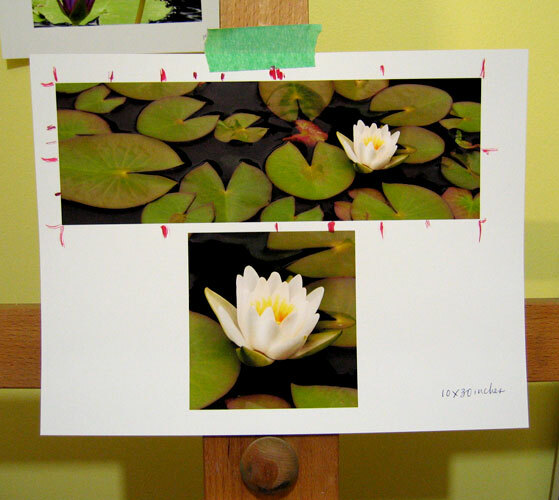 This one will feature a white waterlily surrounded by a multitude of lily pads. As always my first step is to find an inspiring reference image from my digital photo archive. Every year it seems to double in size! This particular image came from a last year’s visit to the Royal Botanical Gardens to see the Roses in bloom. After I’ve adjusted the levels and found a suitable canvas size (I crop the image accordingly) in Photoshop, I print the reference out onto an 8.5 x 11 sheet of double sided matte paper. Sometimes I enlarge a section that requires more detail. In this case it was the waterlily. Now I’m ready to start using oils! My next step will be to start colour blocking the shapes. I’m not sure what I will tackle first. More than likely the lily pads and then the water. It also depends on how ambitious I’m feeling…I might decide on the water lily instead!